I love bedtime. All day we’re all busy—there are piles of things to do, the kids are running around, there are people to see and places to be—but, at bedtime, it’s just us. The kids are soft and snugly, and open to chatting (which is most likely to avoid the inevitable lights out, but I don’t care). They’ll tell me about their day and listen to what I have to say—in short, it’s a dream and the perfect time to really slow it all down and connect before the chaos of tomorrow begins. 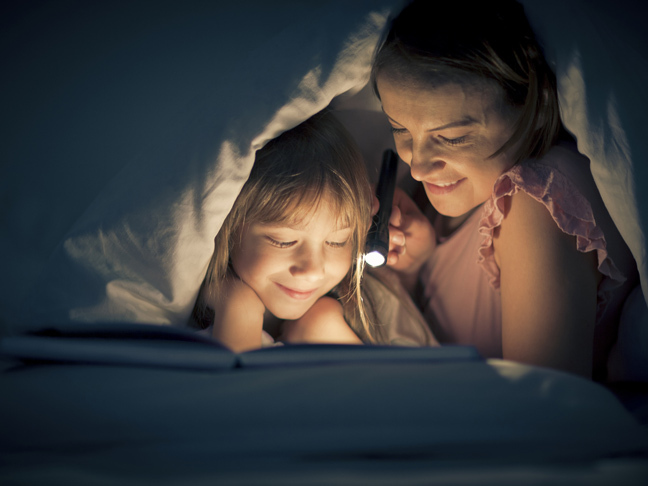 With that, here are 10 ways to connect with your child before bedtime. Make it their time. My husband is great at this. For the fifteen minutes before bed, they can choose to do whatever they want and all of us are on board. Yes, many nights it ends up in a game of family chase, which is not the best activity for slowing things down, but it’s so fun I don’t mind. Look at the stars (on their ceiling). Set up their own personal constellation on their ceiling and then lie under it and make a wish. Write a story that spans the ages. Or at least a few nights. Start telling a story tonight that you carry through the rest of the week. The kids will look forward to finding out what happens, and it will give you some time to come up with a plot. If that’s too much, pick out a chapter book together that you both will enjoy reading. Have them ask you one question every night. It can be anything from how electricity works to what your favorite book was when you were their age. You can always get back to them with the answer, but it gives you insight into what their mind is currently gnawing on. Talk about who’s important. Each night we go through our list of all the people we love and who love our kids. It’s such a nice way to remember people you might not see on a daily basis but who are significant in the kids’ lives; plus, it ends the evening on a note of love. One of these Book of Faces by Pinhole Press is a perfect way to get the conversation started. Run through today and look forward to tomorrow. I don’t know about your kids, but mine are not that likely to open up right after school. Instead, make it a habit to run through their day each evening before bed—they can talk through their highs and lows and get ready for the day ahead. Enjoy a hot drink together. Close your evening out with a hot drink and a chat at the kitchen table. 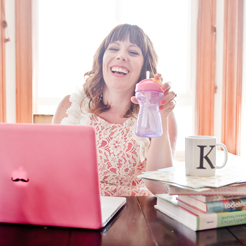 Kids will love sipping out of a grown-up mug, while you’ll love hearing about what’s on their mind. Get ready for the next day together. Take the stress (or at least some) out of tomorrow morning by getting ready the night before. Have your kids pick out what they’re going to wear, line up their backpack, ask them to help put your shoes and purse by the front door—smaller kids love feeling like their help is what’s getting things done. Sing the same song every night. Since our kids were babies we’ve been singing them the same song before we close the door. Because it’s so closely associated with relaxation, I swear we can sing it in any situation and their breathing will slow (so much so that one time at story time we sang it and my daughter fell asleep! ).